How to get London Pass Discount Prices? The London Pass is one of the cheapest solution for active tourists to visit a lot of attractions in London. In addition, you can also save some money on your purchase. Find out how to buy the London Pass with discount prices by using sales promotions and valid coupon codes. The Q&A's and tips on how to get the best price will help with this topic. Directly to Coupon Codes! What are the lowest prices and maximum discounts for the London Pass? How can I subscribe for the newsletter and will I get a discount price that way? How often are there website sales promotions and what discounts can I get there? Where do I find valid coupon codes and how can I check and use them? When ist the best time to buy the London Pass? Where should I buy the London Pass? On-site or online? What should I consider when buying online? How can I get a discount price if I need the London Pass immediately? Here you can find the current prices and coupon codes for the London Pass. Simply choose the desired duration for the London Pass and you will receive the latest offers. If you are not under time pressure, you should be able to save a few percent additionally with the tips for the newsletter promotions. What are the lowest prices and maximum discounts for the London Pass? The following table provides an overview of the standard and discount prices during a sales promotion or by using a promo code. ¹) The maximum discounts have been determined on the basis of a detailed research, nevertheless those values should only be used to serve as a guideline. There is no warranty for completeness or correctness. Discounts vary, depending on the type of offer. A relatively safe way to get some special prices is to subscribe to the newsletter on the provider website*. Promo codes and sales promotions are only offered at certain times. Just have a look at the questions further below to learn more about the different possibilities. The following link will take you immediately to the area with current prices and promo codes. How can I subscribe for the newsletter and will I get a discount price that way? 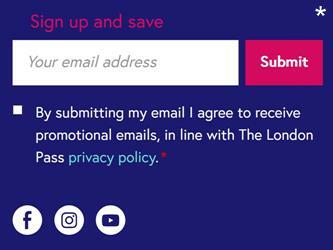 You simply need to enter your e-mail address in the updates box* on the bottom of the main web page from the London Pass. Do not be surprised if you do not receive a message right after your registration. Normally you will get the first e-mail with some information about the sightseeing pass approx. after 1 day. In the next days you will receive some more information e-mails. Usually, after 4 days a message will be sent with exclusive offers for high discounts on the 2, 3, 6 and 10 day version. Especially noteworthy is the 10% discount for the 2 day pass. Through the newsletter registration you will also receive announcements about sales promotions on the provider website. Read more about those saving opportunities in the next answers. How often are there website sales promotions and what discounts can I get there? Usually there are several times a month special offers directly on the provider website*. These sales promotions last about 4 days and normally you will get the following discounts: 8% on the 3 day, 17% on the 6 day and 22% on the 10 day London Pass. If you do not want to miss a sales campaign and you are not willing to check day by day the website, then you should register for the newsletter. By registering to the newsletter you will receive news about the current sales campaigns. Sometimes, on the last day of the website promotion, you will receive an e-mail with exclusive offers for all newsletter subscribers. But if you do not receive this e-mail until about 20:00 o'clock and you only have a few days left for the purchase, you should order while the website sales offer is available or simply apply one of the valid coupon codes. Where do I find valid coupon codes and how can I check and use them? Just enter your coupon code here and click afterwards on -REDEEM-. You will immediately receive a message if the code is valid or not. To see the savings on the sale price, change the quantity for the product in the shopping basket and then readjust the value to your desired quantity. ATTENTION! Do not enter any code if you already receive higher rebates with a current website sales promotion. After the entry only the discount prices with the promo code will be available and these amounts can also be higher! When ist the best time to buy the London Pass? In principle you may use your London Pass within 1 year from the date of purchase. To be on the save side you should not order the Pass online more than 30 days prior to the date you plan to use it. There is a free 30 day Money Back Guarantee*. This gives you some flexibility when you need to change your travel plans and there will be no extra charges. By signing up for the newsletter* approx. 30 days before the start of your travel, you will have good chances to receive an offer with the maximum discount for your London Pass online order. Further you will be able to use the money back guarantee if required. Where should I buy the London Pass? On-site or online? It is much cheaper to buy the London Pass online if you have the opportunity to use a sales promotion or a coupon code. Since you have a free cancellation option within 30 days, when buying online directly at the provider, you will remain flexible. After your online order you can simply use the pass with a smartphone app* (iOS or Android) or if you prefer it is also possible to pick it up* from a location in the center of London. The pass is also available on-site in London at different big underground stations and railway stations. Usually you have to pay on-site the higher standard price. What should I consider when buying online? Before you place your order online you should think about your choice of delivery or pickup*. The easiest and cheapest way, in the most cases, is to activate the Mobile London Pass on the smartphone (iOS or Android). Then you just have to show your smartphone with the app at the different entries. Unfortunately it is not possible to combine the travel option with the Mobile London Pass on the smartphone. The travel option includes an Oyster Travelcard with a credit for trips by underground and bus. A comparable standard Oyster card can be easily obtained on-site at various underground stations. More information about the Oyster cards can be found at the following link. When you pick up the Pass you will only be able to use the travel option after you have picked it up. Therefore, normally a travel option will only make sense together with a shipment before you start your trip. Please do not forget to take into account the delivery times. How can I get a discount price if I need the London Pass immediately? If there is no website sales promotion on the London Pass website*, than you only have the option to receive a discount price by using a current coupon code with your online order. After the online purchase, you may use the sightseeing pass immediately with the mobile ticket on your smartphone, or collect it from a ticket counter in the center of London.